Shake container thoroughly, then attach to garden hose. Turn water supply on at the source. Water pressure will build in hose since the sprayer is already in the "OFF" position. To apply product, bend safety tab and turn the control valve clockwise to the "ON" position. For best results, hold sprayer and bottle level, and direct sprayer in a sweeping side-to-side movement. Spray the contents of bottle (1.25 litre of product) evenly over 500 m2 of lawn. For smaller areas, spray at the rate of 100 mL over 40 m2. Do not overlap areas already sprayed. To spray water only, turn the control valve clockwise so that the valve indicator arrow is pointing to the "WATER" position on the sprayer. When spraying is complete, turn the control valve to "OFF" position. Turn water off. Apply only when weeds are present. Applied to the leaves of actively growing weeds. Bedstraw, Black Medick (Yellow Clover), Buttercup, Chickweed, Clover, Creeping Charlie (Ground Ivy), Dandelion, Dock, English Daisy, Hawkbit (fall dandelion), Heal-All, Knotweed, Narrow-leaved Plantain, Ox-eye Daisy, Plantain, Poison Ivy, Ragweed, Sandwort, Shepherd's-Purse, Speedwell, Stonecrop. 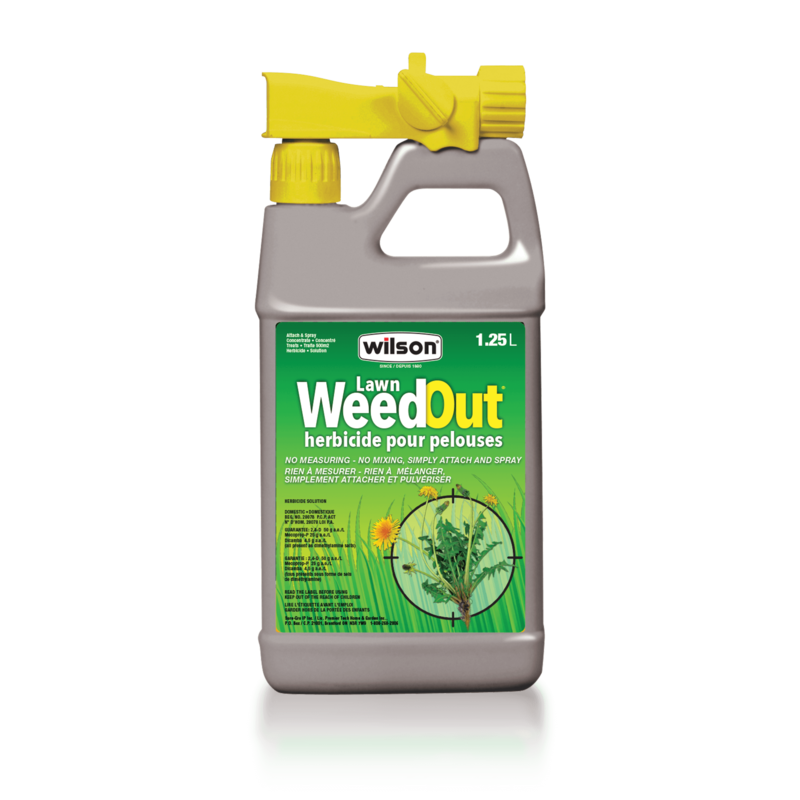 Apply in May, June or September when weeds are growing actively. Repeat application in 3 – 4 weeks may be required for some species. Do not apply in very hot, very dry or rainy weather. Do not apply to newly seeded lawns until after the 3rd mowing. Do not reuse container. Discard empty container in household garbage. Unused or partially used products should be disposed at provincially or municipally designated hazardous waste disposal sites. Keep from freezing. Between 5 ° C and 35° C.
Avoid inhaling spray mist. Do not apply in very hot, very dry or rainy weather. Do not apply to newly-seeded lawns until after third mowing. Do not use on bentgrasses. Do not cut grass for several days after application. Do not water within 24 hours of application. Read label carefully before using the product.